The Greeks believed in beauty so much they created a word to describe it - “esthetics”. The word went through a few derivations to lead to what it is today, aesthetics, but it always meant the same thing, and that is concern with beauty and the appreciation of beauty. The home is a space that is yours. If you want to change your countertops, you can put anything there that is aesthetically pleasing to you, and not one soul has the right to fault you. You evaluate your thoughts about color, what the space is, how you want to light the area, and all the accessories you want to add right down to things like your stereo or your television. In the end, it’s all about your appreciation of beauty and what you want to create in your area that makes you happy. Once you are in your home or apartment you want to make it yours. Change often comes to kitchens and bathrooms, although fireplace and bathroom surrounds are very noteworthy, but kitchen design seems to lead the race. 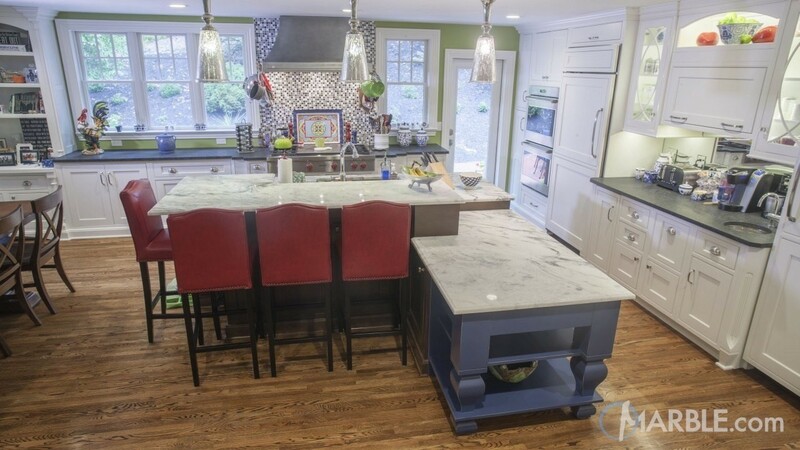 Kitchen countertops add a completely different flair that can be your unique signature and basis for change. The natural stone industry provides the pen you sign that canvas’ autograph with. They can provide thousands of stone colors that let you find your unique style. If you want that bright, sunshiny kitchen, choose a light granite or marble. If you want a room with darker, more rich color you can find it in the variety of natural stones available. Almost any hue is available to you. The crossroads where your tastes meet with the space you have is the place interior design becomes important. It makes your home a place to be you without outside interference, and that’s even if you use an interior designer. The truth is you don’t have to use anyone else since there is online room planning tools available to you. Interior design is not just something that may impress your visitors, but it’s what you are. That blue kitchen countertop punctuates your love of the deep richness of the blue that is Sapphire Blue granite, or even something lighter like the blue in Labrador Bianca granite. This is all about you and your perceptions. Interior design develops your home into what exclusively satisfies your distinctive aesthetic appreciations. Being you is important, and designing your home should be fun, and something that indelibly stamps your brand. Whether it is your kitchen design, your fireplace surround, or the intimacy of your bathroom creation, your flavor is added to make your home reflect your matchless touch. Join SlabMarket and look through the thousands of slabs available. When your slabs come from one of the many top quarries from around the world, you know you are delivering the best countertop materials to your customers. Take your business to new heights and fill a whole container of natural stone market winners to make your customers smile and have confidence in you. There is a wondrous array of stone colors that accentuate everything in a design style. It’s true, it takes time to complete interior design, but Visualizer+ 2D and 360° room planner can help you cut time down dramatically. No longer do you have to physically see the granite vanity top, or the fireplace surround material to have a good view of what to expect. Interior design of your granite and marble ideas are quickly viewed from the comfort of your home where your whole family can appreciate your contemplations of those light granite colors, or that kitchen design, or bathroom design. The Visualizer+ might inspire that new Granite Vanity top, or a whole new bathroom design, along with a new kitchen. It’s a tool for exploring and creating. Whether you use House Tipster’s Virtual Room planner link, or go straight to Marble.com’s Visualizer+ 2D and 360° room planning tools, your imagination is inspiration, and proof of the importance of very personal interior design.